A crypt is about the cellar of a church.. In the middle of the cathedral of Florence there is a staircase a few meters deep. On the left you see a shop selling books and souvenirs about the cathedral and Florence. On the right is the cash register. Here you can buy tickets for the crypt. As already mentioned above, there is only one total ticket for all sightseeings around the cathedral. The cathedral itself is free of charge. There’s a lot to see in the crypt below the church. Highlights are graves and gravestones. The tombstones can be seen from close up. In the crypt of the cathedral, the world-famous builder of the dome of Florence, Brunelleschi, and some important figures of the Medici family, the ruling family of Florence, are buried. 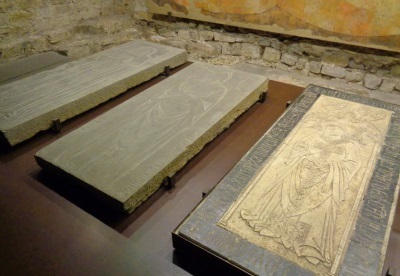 The tomb of Brunelleschi was found only a few years ago. Even more interesting in the crypt are the excavations. The ancient, previous cathedral of Florence stood on the same site as today’s cathedral. 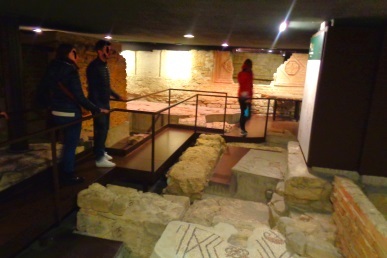 In the crypt, walls of the former church „Santa Reparata“ are uncovered. 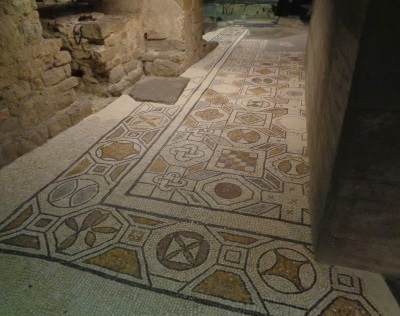 The highlight, however, are the mosaic floors of the former church from the Middle Ages. In order to protect the valuable antique floors, you walk partly on footbridges and on glass plates through the crypt (see picture below). The excavation under the cathedral church was started about 50 years ago (1965) and is not yet finished. In 2004, the excavations made headlines worldwide when nine bodies were found, including the former ruler of the Republic of Florence, Gian Gastone (died 1747). In the case of some deaths under the cathedral of Florence, the cause of death could even be determined by modern investigations. Some, especially children, died of malaria. The previous assumption that many people of the Medici family had gout was, however, largely refuted. The crypt is usually open from 10 am to 5 pm. Since you enter the crypt via the cathedral, you can only enter if the cathedral is open. Because of masses in the cathedral, the crypt is usually closed on Sundays. The crypt is in Italian Cripta. – The cathedral Prague, the biggest church in the Czech Republic. – The cathedral Vienna, die biggest church of Austria.